A few months ago a local parent of a child with Type 1 posted a request for help from Portsmouth University’s Pharmacy department for people to be interviewed by their students. It didn’t sound like my cup of tea to start with but then it dawned on me: I’d get two hours to talk about life with Diabetes to people who actually wanted to listen. Oh yeah, hello, I’m in. As I walked through the corridors of the University on Thursday afternoon I wondered who was more nervous, me or the students. It turned out it was the students, but only at the start as they got into the flow after question 1 and asked some pretty good questions to further their learning. Working in pairs one student interviewed me whilst another operated the videoing and took notes, lots and lots of notes. They use the videos to watch their own performance so that they can improve their interviewing technique and learn how to phrase questions better. To be honest though they didn’t need to worry about asking me open questions to get me to open up. Bearing in mind that they were only year 1 students who had only been at Uni for a few months they all amazed me with their level of understanding of everything I said. In the first couple of sessions (of the 7 or 8 that I did) I threw out words like ‘insulin’, ‘HbA1c’, ‘hypo’ and ‘postprandial’ whilst tentatively saying other things like ‘CGM’, ‘diabetic ketoacidosis’ and ‘diabulimia’. But they knew about everything I said and listened without requiring further explanation; I guessed they had been prepping hard beforehand. After 2.5 hours of being interviewed I was pleased on many levels: I got to talk to people who were really interested; I got to answer so many great questions; I helped the students realise the reality of living with a child with Type 1; I got through talking about Amy’s diagnosis without feeling too sad. I’ve taken part in many of the weekly (Wednesday night at 9pm) #GBDOC tweet chats since they started a couple of years ago, I enjoy them and generally get a lot out of them. A couple of weeks ago I got a message from Paul (@t1hba1c) who hosts the #GBDOC tweetchats who asked whether I’d like to host a tweetchat about bring up children with diabetes. I was initially reluctant: why would anyone want to listen to or answer my questions; there’s many more parents who with their eloquence could host a great tweetchat. After a couple of messages between Paul and me I decided to do it and then proceeded to panic about what to ask. The easy solution was to ask other parents what they’d like to know so these questions are not just mine, they’re from a mixture of parents. CGM – Continuous Glucose Monitoring, such as the Dexcom G4 Amy uses, gives a constant, slightly delayed reading of a PWD/CWD’s glucose level. CGM-in-the-Cloud/Nightscout – a system developed by PofCWD which allows parents to view their kid’s current glucose level whether they are, many use a Pebble watch or iPad to view their kid’s CGM data. More info here. Q1a Employment: has having diabetes affected your employment chances? Did you change your career path/dream because of it? One of the first things parents are often told at diagnosis is that it won’t affect their child’s career unless they want to join the Armed Forces. As time goes on you hear that people haven’t been able to become pilots, or paramedics and the list seems to go on. Some kids already have thoughts of joining the Army etc., then they’re diagnosed and those dreams stop. Did you dreams stop? I’d never dream of steering Amy towards a certain career path because she has Type 1 Diabetes, she needs to choose her own path, but it seems to me that there must be certain jobs where testing glucose and taking the odd break for treatment is a lot easier than others. Next up, one of the worries for parents is about their kids having a happy family life. Q2 Relationships: has having diabetes been a factor in finding/losing a partner? Has it caused issues in your relationships? On many of the parents’ Facebook groups many talk about how their marriage fell apart after their child was diagnosed, blaming the stress from prising apart already existing cracks. Some worry that their child might find it difficult finding their ideal partner, although I believe the truth will out and Amy will have no trouble finding that decent guy (or girl of course). Moving on to positivity, about kids attitudes and fear and confidence. Q3 Attitude: do parents instil confidence or fear in their CWDs with things like overnight checking, CGM, CGM-in-the-cloud? I often wonder whether my own personal paranoia and control-freakishness is instilling fear in my daughter’s mind rather than what I really want – for her to be independent. My interest in her using CGM has led to us all to expect it to be there every day and I can’t help but wonder if this is sending out the right message. Back in the day parents didn’t have these options and all the PWD I know seem to have grown up pretty well and turned into to great adults. Q4 Positive clinics: How should parents go about teaching our kids to question their HCP’s? What are the important points? Our Consultant is great, she rarely talks to us parents but instead talks straight to Amy and all about the soft stuff too, no focus on HbA1c as such. Amy though rarely thinks of any questions for her sessions as she’s happy with her care. I want her to be able to question the HCPs, learn from them, teach them so does anyone have any tips of how to achieve this? The next question is whether or not it’s right to restrict things due to worries about the future. Q5 Care focus: should our focus be the current or the future? What do you wish your parents did or didn’t do? Any wind ups? The current or the future: I seem to have two choices, either make life easier for Amy now and not worry too much about her day-to-day levels OR be very involved in Amy’s day-to-day management helping her with basal/bolus management & set changes etc.. I choose the latter which I know can wind Amy up, but I do this to help her future as much as I can, hoping to minimise complications as much as possible. But which approach is right? Am I right to steer her away from, or make her wait for, a carb loaded snack when her blood glucose is already quite high? Should I let her eat anything her friends eat? Or am I right to try and teach her to minimise the food spikes going too high? I guess many PWDs either wished their parents did less or more during their childhood. Any experiences you’d like to share? If we get time I’ll ask this one. Q6 Letting go: what’s the best way/age/time to hand over care completely? Do PofCWD ever fully let go? Did yours? I tell myself that I’m learning all I can about Type 1 to help Amy’s future and to stop Amy having to learn all this, that I’ll educate her bit by bit and at some point let go completely. Honestly, I’m not sure I’ll be able to do that. Have your parents ever let go fully? Do they still ask what your glucose level is occasionally? Many thanks to @theGBDOC for the opportunity to host this tweetchat and to Rachel and Louise for helping with creating some questions. Back in April Dr Kar (@parthaskar) from the neighbouring QA hospital asked if Amy would be up for helping him out at a conference he was going to, the National Paediatric Diabetes Team Meeting hosted by Lilly in Birmingham. I guessed she wouldn’t, it’s not her thing, but I asked and she said ‘Yes’, her thoughts of helping Partha outweighing her fear of public speaking. Part of the excitement was getting chauffeured to Birmingham in a shiny Mercedes but he was due at 11:30am and should have been here 15 minutes ago. Our house is notoriously hard to find and it turns out he didn’t have my mobile number. Finally I found him by walking around the area and we were off. I quick call to Nicki at Lilly and we found out Amy was on at 14:45, our ETA 14:30, perfect. That was until the roadblock north of Oxford which saw us divert towards London. ETA 14:50, not so perfect. Nicki said don’t worry though. Rushing into the hotel Nicki met us and Amy got miked up, alongside 19 year old Rebecca who goes to QA, but where was Partha: stuck at Oxford. The chair, Dr Fiona Campbell, padded out for a bit but it was clear Partha wasn’t going to get here in time and the show must go on. Easy for adults to adapt to but not so easy for a 13 year old with a fear of public speaking. Fiona took control and Amy and Rebecca took to the stage. The idea of the slot was to be a chat show, with Partha calmly asking Amy and Rebecca questions about their care, what they like, what they don’t and what would be the ideal service for them. Amy knew these questions and we discussed in the car how she’d like to respond, trying to make the experience as easy for her as possible. Trouble is Fiona didn’t know these questions, nor the interviewees, but I must say that she winged it incredibly well. Amy looked nervous on the sofa sat next to Rebecca but then I saw she was also sat next to Alex Silverstein, someone whom I follow on Twitter and we’re friends on Facebook but our paths had never yet crossed. I felt better, Alex would take care of her I thought, although of course he didn’t know it was Amy sat next to him. With the first question asked Rebecca gave a great long answer, before Fiona asked Amy who then got a bit tongue tied. More and more questions asked and Amy opened up giving great answers with the information she knew about. She was asked about talking to the GP about diabetes and said she never had and wouldn’t as she’d talk to her diabetes team. Fiona asked why Amy wouldn’t think about going to the GP and Amy answered exactly the same way I would: if it’s diabetes related we’ll go to the people who are the specialists. Questions were asked about Skype consultations, preferred types of wards for any hospital admissions (general young persons’ ward or specialist diabetes) and whether they’d prefer letters being addressed to them or their parents. Letters? No thanks, these are young people, they want emails, or (as suggested by Fiona) text messages. They were asked if they ever saw a post-clinic letter, they hadn’t. I felt like stepping in and saying that yes we get a letter, two months after clinic, a letter which informs us of our insulin-pump-wearing child’s basal-bolus units and ratios but nothing about her pump’s basal profile or insulin:carb ratios. That letter goes straight in the bin. With the show over Amy’s first DSN Debbie came over to see us. She had no clue we’d be there and took a while to recognise it was Amy on stage, but she was so proud, remembering that 10 year old who she’d helped through her first injection. I was bowled over to see Debbie again and similarly to meet Alex after all these years. I shared text messages with DSN Sarah who works in Southampton but couldn’t see where she was in the room. One of our DSNs was at the conference but we never managed to see each other. But that wasn’t too much of a surprise in a room of 300 or so. Post chat show and we shared some lunch with Partha – who arrived just as the session ended – and we discussed the event, how it went, questions that were asked. It was nice to talk about emerging technologies too, like the Abbott Flash Monitoring. Diabetes has improved our life. What? Really? A couple of weeks ago I attended a training course with Diabetes UK in London, as I’m soon to become one of their Peer Support team. I’m not going to write about the training itself as for confidentiality reasons that’s between those of us on the course but there’s one part of it we did which made me (and a few others) think about life since diagnosis. Just before lunchtime arrived we were asked to search our soul to find out how we really feel about our lives with diabetes and whether it would raise any further questions, or highlight anything we needed to explore further. This seemed to be a good thing to do as unless we know and understand our own journey how can we help any of the newly diagnosed cope with the early days of their journey. Drawing lines on a piece of paper doesn’t come naturally to me but I felt comfortable with our diabetes journey and drew my picture of troughs (and troughs) and peaks (and peaks and peaks). I started on the left of the page in the middle but soon wish I hadn’t as I ran out of room. I’d finished way before everyone else and my mind wandered back to a Technical Drawing lesson at school when I proudly approached the teacher asking what to do next, the teacher took one look at my drawing and suggested that I’d finished before everyone else as I’d neglected to do it properly. I checked my chart. No, we’re good, I’m happy with that. Diabetes improves our life. What? Really? Here’s my chart – which may not be drawn to scale whatsoever. Hover over the yellow buttons to see what happened at that point in time. At diagnosis, our mood dropped, trying to come to grips with coping with type 1. Thoughts of cancelling the trip to India also got us down. Lunchtime chat: could this journey really be accurate? Another peer supporter, Nick Guerin (who won this year’s Quality in Care Diabetes Peoples’ Award) and I were chatting at lunchtime and talked about our own charts, which amazingly weren’t dissimilar, strange considering our journeys have been quite different. Nick’s blogged about it in his own blog Type Aware. We both quizzed our own charts’ finishing positions: could it really be right that we both thought we’re in a better place now than before diagnosis. It seems crazy but actually I do believe it’s right. I believe having diabetes has made Amy more determined to do well, to beat her peers in activities, to be thankful for what she has and can do. I feel I’m doing more things for others than I ever did before diagnosis too. Having said this I’d be much happier right now if diabetes would bugger off. Why not draw your own journey since diagnosis and see how you get on. You may be surprised how you actually view your journey and it may raise some questions for you to explore. Everyone’s different and there’s no right answer, this is just for fun. Many months ago Dr Kar from Portsmouth’s QA hospital tweeted a question to the diabetes online community to see if there was any interest in an idea he (or his team) had: would people like the opportunity to meet with healthcare professionals outside of the normal setting, asking questions openly and receiving open answers. The response was positive, especially from me, and the QA team set up organising the event. The need for an event like this was clear to me: it would give a chance to speak openly with professionals who don’t have a defined set of questions to get answers to, or things they have to inform us about. I could ask those questions which seemed silly to me, the sort of things I don’t want to waste anyone’s time over, the sort of thing I would definitely not call the clinic about. Clearly others felt similar things. I’d been following the discussion about the SweetMeet before my Twitter friend Laura even put that name forward. I was excited about attending, along with Amy. The announcement came out that it was on the 11th May and was open to any type 1 diabetics…who were over 17. Darn it, Amy’s only 12, I can’t go. I wished Dr Kar luck but said it was shame I wouldn’t be able to go and he replied by saying he had the power to break the rules for certain individuals. Great, we’re in, I was happy again. Initially it was difficult to figure out what the event would be like until Dr Kar coined the phrase “Speed Dating With The Professionals”. The mention of free bacon sandwiches smoothed the way for many I suspect. When trying to register for the event I called and spoke to a lady who took my details. “Your name?”. I gave it. “Your address?”. I gave it. “Can I just check that you’re over 17 and have type 1 diabetes?”. “Erm, well actually no, but I’m allowed to come, just put me down and ask Dr Kar.”. Driving to the event today Amy and I wrote down as many questions as we could, just in case we got the opportunity to ask them. Arriving this morning we registered and met with Laura and quickly found the bacon rolls, mmmmm bacon! We looked at the stands and happened across the one run by the widwife team. “Okay, Amy we don’t need to worry about this for a little while”. Instead of moving on we had a really good chat with the two midwives there. It was time to take our seats and when walking into the room we headed to the back only to be greeted by a “hello Kev, what are you doing here?”. It was a guy from work, a guy who I see often, a guy I’ve played football with for years, a guy who had type 1 diabetes, yet I never knew. It was great to bump into him and have a great long chat about diabetes care, pumps and stuff. Dr Kar is an eloquent speaker, a great advocate of good service by his team and someone who could literally talk for Britain, but in a nice way. He’s so enthuastic about being able to work together (patients and professionals) and shape the future together that listening to him talk about it makes you feel so positive. He spoke about how the event came about, the ideas, the desires and then he passed over to Laura. I only got involved with the Diabetes Online Community after a friend spoke about Laura’s Ninjabetic support group (read this) being in the news. We’ve spoken on Twitter so many times that Laura seems like a member of the family and I know her story so well. Laura, Mark and I had tweeted earlier in the week about Laura’s speech: she didn’t know what to say. She suggested the three of us do a flash mob but luckily Mark and I turned it around and suggested she just spoke about herself, about her diagnosis, about her salvation from the dark days of ignoring diabetes care. We all sat around the 7 tables, there was six on ours including me, Amy, Laura (@ninjabetic1) and Mark (@thedteam2) who’d travelled all the way from Swindon, plus two other guys from the Portsmouth area. Each of the 7 professional people/teams switched from table to table to table in true speed dating fashion, having 8 minutes each. In those 8 minutes we had to get through multiple questions from our side and theirs. This event wasn’t just about patients getting answers it was also about professionals finding out what patients require, so that they can improve their service. All in all it worked very, very well, it was just that 8 minutes wasn’t enough, we could have done with about 30 minutes each, but that just wouldn’t be realistic. At 11:15ish we broke for refreshments which gave me a chance to chat with my friend from work. Whilst talking 76 year old Derek Bockett said hello and we had a nice chat. I recognised him from last year’s JDRF Walk To Cure which we’d done. He’s an amazing chap, 76 years young, full of life, fit as a fiddle and has had type 1 diabetes for 61 years! He told us to keep active and make sure we kept ourselves well. What a great advocate for diabetes. Amy came up and asked me to fill-in the carbohydrate counting quiz: she’d done it and wanted to increase our chances of winning the prize. I didn’t bother. Back in the room and Dr Cranston (Consultant Diabetologist – and more importantly Laura’s pump consultant) gave a great presentation about what’s on the horizon for type 1 diabetes, current stuff, future stuff and some quite complex stuff. I enjoyed the talk even if some of it flew right over my head. I really admire Doctors who give talks like this. As a geek I know how hard it is to get things across in a language which is understood by the layman, without comprising what you need to say and the points you need to get across. Dr Cranston did this extremely well. It was time for the carbohydrate counting quiz result. “The spag bol was 90g”. Amy wispered “darn, I said 100g”. 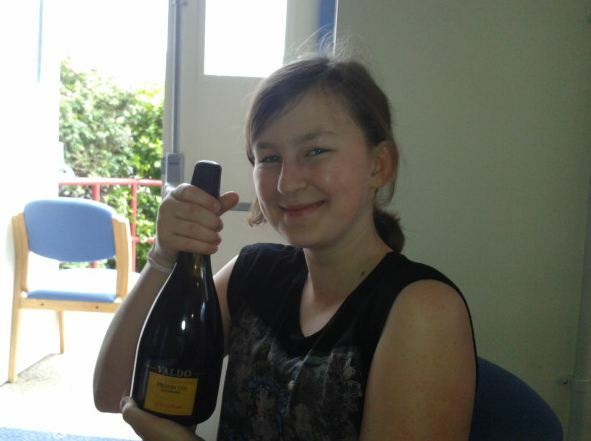 The problem was the the prize was a bottle of champagne and Amy was 12 and it wasn’t good form for a healthcare professional to be giving alcohol to a 12 year old. I said that that’s the standard age to start drinking in Portsmouth but (luckily) no-one heard me. The champagne was given to Laura, sat next to Amy, who put it on the table. Yay, we’d (erm I mean Amy had) won some champagne. I’m so proud that in a room full of diabetics many of whom have counted carbs for years that Amy’s knowledge proved the best. Well done Amy. We went to yesterday’s JDRF Discovery Day in Bristol not just to listen to their talks but also to meet up with lots of people from the online Twitter community for diabetes, affectionately know as the #DOC. One of them, Annie, is a huge advocate for Animas pumps in general and especially of their latest offering the ‘Vibe’ which her daughter has been using for a few months. *Stop Press: Because Annie is such an advocate of Animas, I propose they are renamed Anniemas for the rest of this article. Vibe! Vibe!? Why on earth! This was either a very clever marketing ploy or people in Anniemas’s* Department of Pump Naming lead very sheltered lives and need to get out more. Amy’s 15 year old sister Emilia has already told Amy she can’t have one of these pumps due to the name and even at 12 Amy knows what it means. At lunch yesterday I got a giggle out of Emilia yesterday by telling her that Paul sat opposite had a black Vibe in his pocket. If Amy gets one of these I’m going to have to tippex out the name on front, either that or smirk every day I see it, for four years – that’s a lot of smirking. Dear Anniemas*, for the record please do not call your next pump The Rabbit. Annie’s daughter has just recently got the Anniemas Vibe pump and when you change pumps you get to keep your old one, which in this case was the Anniemas* 2020. The 2020 is very similar to the Vibe, a little smaller in length due to the extra bits the Vibe needs to incorporate CGM (continuous glucose monitoring). Armed with some old insulin Annie showed me how easy it is to full the pump reservoir from a Humalog 10ml vial, although to be honest I was all fingers and thumbs as this was the first time I’d tried anything like this. Annie passed me one of Anniemas’s infusion sets, the Inset II, which comes in three colours, this one being white. Some people say the pink ones hurt less; I think that may be a myth. Anniemas’s* infusion sets are self contained, everything you need to do a set change is contained in the set itself: there’s no need for you to carry any set insertion device like you do for the Accu-chek Combo. These infusion sets fit any pump whose reservoir has a Leur lock at the top, so they can be used on Anniemas*, Roche and Medtronic pumps. I found this out from another Twitter user who used to use an Anniemas* 2020, moved to a Roche Accu-chek Combo but didn’t like their infusion sets so uses Anniemas* ones instead. Annie talked me through preparing the set for insertion. I said “you do know I’m not going to put this on myself don’t you?”. She just smiled. Once the set was prepared I re-iterated I didn’t want to insert it on myself – now though I wish I had – so Annie took it, pulled up her sleeve and inserted it into her upper arm. She didn’t flinch. I’ve only found out since that she’d never done this before in her arm and didn’t know whether it would hurt. She says it didn’t, I’m glad. Bolusing on any pump is a relatively straightforward affair and the Anniemas* is no different than most. It does have an audio bolus option which is designed to allow you to bolus without looking at your pump. As Paul – who runs GBDOC web site and tweetchats – said, you press then button and it beeps allowing you to count the units, meaning that a hidden pump does not have to be accessed. Don’t be confused though, this is not a rival for the covert bolusing offered by the Accu-check Combo. Amy and I played with the insulin-filled 2020 and within seconds she was bolusing, dripping insulin all over my fingers – the little tyke! (ha ha). We played with all the other functions and it made Amy realise that a transition to this pump wouldn’t actually be a problem. Annie hasn’t really set this up on the new pump but the Vibe has a food list. It’s a list of up to 500 foods and their carb values and could serve a limited use, although with mobile phones these days and MyFitnessPal – other apps are available! – it’s hard to see it being used a great deal. Ironically, for a pump which is regulated in the UK (but not the US) for CGM use, the food list is not populated in models outside of the US. So UK users need to create their own food list, from scratch. Having said all this it could come in useful as Amy is due to go to Europe on a school trip a few weeks after (hopefully) getting her pump. We could therefore pre-load a Vibe with a list of common foods indigenous to where she’s staying. This would be useful as she’ll not have an internet connection on her phone whilst there. Yeah, yeah, it’s waterproof, it’s got an IPX8 rating just like the Accu-chek Combo has. So why then do Roche tell you to try not to get the Accu-chek Combo wet, whereas Anniemas* actively encourage an occasional dunk. For info Medtronic’s Paradigm Veo pump is rated as IPX7 (Protected against water immersion – Immersion for 30 minutes at a depth of 1 meter). Paul made a very valid point (I’d not thought of) when he showed us the back of the Vibe. It’s curved. This, he said, made it much nicer to wear against a curved part of your skin. He also said that as he’s got to carry or wear his constantly for the next 4 years it makes sense to pick a pump based on weight/size/design. It’s a very valid point (yet again). I’ve viewed the progression to Amy getting a pump as a ladder, one that we appear to be well and truly on. For the record I don’t really like climbing ladders but I’ll make an exception for this one. The first rung on the ladder is just learning about the basics about pumping, so you can decide on whether you want one. The second rung is making that decision and requesting a pump. The fourth rung, at our hospital, is to be invited to and attend a carbohydrate counting training session. Our fifth rung will be to get some demos from either the special pump nurses or by reps from the pump companies. I’m not sure how many more rungs there’ll be but we’ll worry about that later. Where to start the research? I’ve felt a little bewildered on where to start with fact-finding about pumps, even though there’s only 3 key runners available to me. It should be simple when you consider that it took only an hour or two to decide I wanted the buy the house I’m currently living in and considering the cost of a house against that of a (free to us) insulin pump it’s hard to figure out why we wouldn’t just take the first suggestion from the hospital. I mean this diabetes malarkey is hard enough to contend with at the best of times so why not just let someone else choose the pump? But somehow there’s no “oh it’s lovely” or “that’ll do” with the pumps and once chosen we’re tied into it for four years, so we’ve got to make the right choice. Or do we? Does it really matter? Aren’t they all the same!? I didn’t know the answers and worse I didn’t know the questions, hence my bewilderment. For the past few weeks I’ve been lightly researching the pros and cons of each of the pumps which are available to us, which are by Animas, Medtronic, Roche/Accuchek. The Omnipod is available to us but our clinic will only partially fund it as it’s a lot more expensive, so I’ve discounted that one as partially funding it isn’t an option my bank manager will agree to. I’m not sure exactly which models are available for us to choose but for now I’m presuming it’ll be the Animas Vibe, the Medtronic Paradigm Veo and it’s definitely the Roche Accu-chek Combo. The Medtronic model may not be the Veo but I’ll do my research on that to start with. I’ll probably do another post on the information about each pump once I’ve learned more about them all. A fifth pump, the CellNovo looked like everything this geeky father could wish for his daughter but after contacting them it seems it’s not a likely option for the foreseeable future. Darn it! The hospital are openly (currently) keener on two pumps, the Roche Accu-Chek Combo and the Medtronic Paradigm Veo. They don’t hide this, they tell you up front and the reason is very simple: the more they know the pump the more chance there is of offering telephone support from memory and the quicker any problem is resolved. After a quick discussion though it was clear that whilst this is their preference it is not a restriction and they are more than happy for us to go with another pump, such as the Animas Vibe or Omnipod. They do have an Omnipod user at the clinic but only one. If we go for a Vibe we’ll be the first, but this isn’t something that bothers me, we can support the unit ourselves, it’s the basal/bolus rates that we need help with. Suddenly it dawned on me that there’s loads of pumpers out there already, many of whom I’m either following on Twitter or in many cases I’m following their parents, on Twitter that is, I’m not a stalker! So to the DOC I turned and started gaining an insight into what questions I need to be asking or researching the answers to. It seemed clear from the outset that seeing a pump or two would really help matters. I’m excited about tonight as after work Jane, Amy and I are meeting up with a couple of #DOC people who live locally, both of whom I’ve never met. After one of them – @Ninjabetic1 – recently got a AccuChek Combo pump we chatted and I asked if a demo would be possible, after all only seeing a pump actually started to change Amy’s feelings towards them. “Of course” she said, unsurprisingly. After a while we realised that another local #DOC person had a Medtronic Paradigm and was very local. She also was more than happy to give us a demo. So I’m excited to be seeing a couple of pumps but especially at meeting a couple of people I’ve conversed with over Twitter for quite some time. Tomorrow Amy and I step up to rung four: we’re off to the hospital for our pre-pump carbohydrate counting training session. After talking with the diabetes specialist nurse it seems this will be a session very similar to the first with a mixture between people just about to start carb counting for the first time and two families (us included) who are going on a pump soon. Things are really moving on quickly and after the training session tomorrow morning the other pre-pump family and us are returning to the clinic for an informal pump demo by the hospital’s Roche pump specialist. Personally I hope that I know everything they’re going to tell us as it will prove that I’ve done my research right. But even if this is the case it will be nice to get the hospital’s angle on the pump. I might even get to find out whether the Mexican-wave-bolus is an urban myth or not. We’re ending a very busy diabetes related week with a visit to JDRF’s Discovery Day in Bristol on Saturday. An event where the parents get to listen to talks whilst the kids get to visit the @Bristol science centre in the same building. We weren’t due to go to Bristol, we’d booked for Dorset, but as soon as I realised a couple of other #DOC people were attending I wanted to go there instead to meet them. Now, there’s so many #DOC people going that I’m more excited about meeting them than going to the JDRF day; I can’t even remember what the day is about anymore. Oops. A bonus of this day out is that one of #DOC has an Animas Vibe and has kindly offered to give us a demo. So within three days we’ll have had demos of every pump that we’re currently thinking about. Then the real research can begin.